Use the Special Effects Tab on the Page Editor dialog box to set miscellaneous options, such as image copying, page transitions, background scrolling, and page centering. 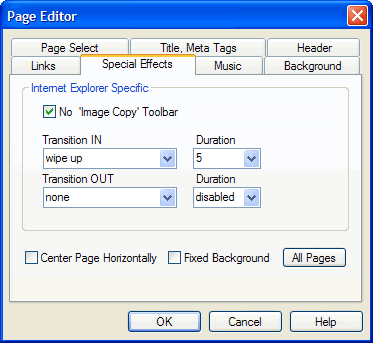 Apply miscellaneous settings to your page using the options on the Special Effects Tab of the Page Editor dialog box. No ’r;Image Copy’ Toolbar On large images viewed in Microsoft® Internet Explorer® browsers, a floating toolbar will pop up that will allow you o save, print, or email the image. Click to checkmark if you want to prevent this toolbar from appearing in the current page. Click to un-checkmark to allow this toolbar. By default, the No ’r;Image Copy’ Toolbar option box is selected (checkmarked). Note that this option will not disallow users from right-clicking the image and choosing either the Save Picture As or Save Target As options. Transition IN Select from the drop-down menu a transition effect to apply to the current page when the page is loaded in the browser. Then select from the Duration drop-down menu a value in seconds for the transition effect to last. Choose a value between 1 and 30. Transition OUT Select from the drop-down menu a transition effect to apply to the current page when the page is exited. Transitions are visible only in Microsoft® Internet Explorer® browsers. Center Page Horizontally Click to checkmark to center the content of the page within the width of the browser window in which it is being viewed. This setting will ensure that your page appears in the center of the window if it is viewed in a browser window that is wider than your page. Fixed Background Click to checkmark to freeze the background, so that it will not scroll when the foreground content is scrolled. This is a good setting to use with watermark image settings in the page background properties. For more information, see Background. All Pages Click to apply the current special effects settings to all pages in the project.